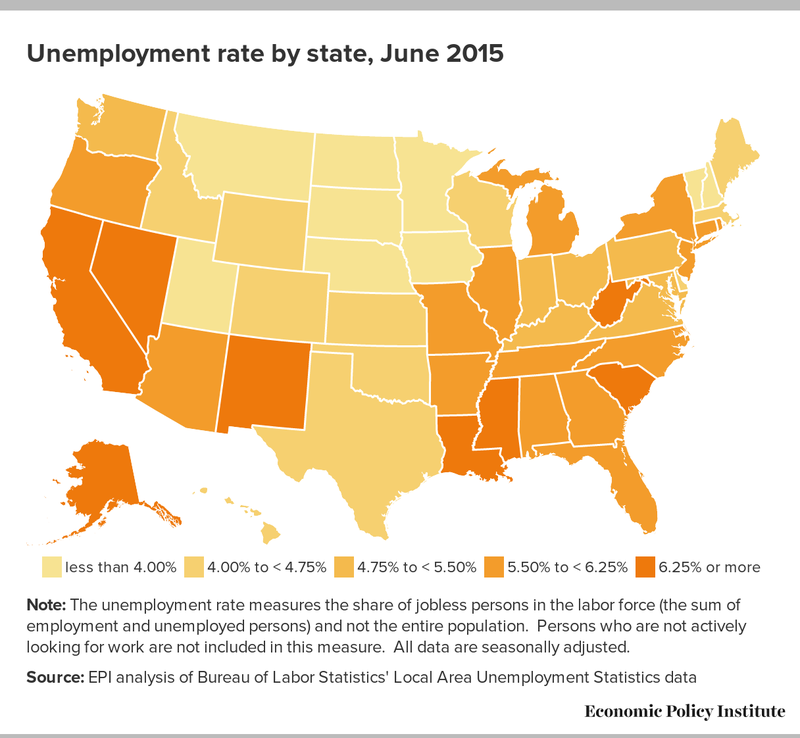 The June State Employment and Unemployment report from the Bureau of Labor Statistics showed little change in state labor markets heading into the summer months. 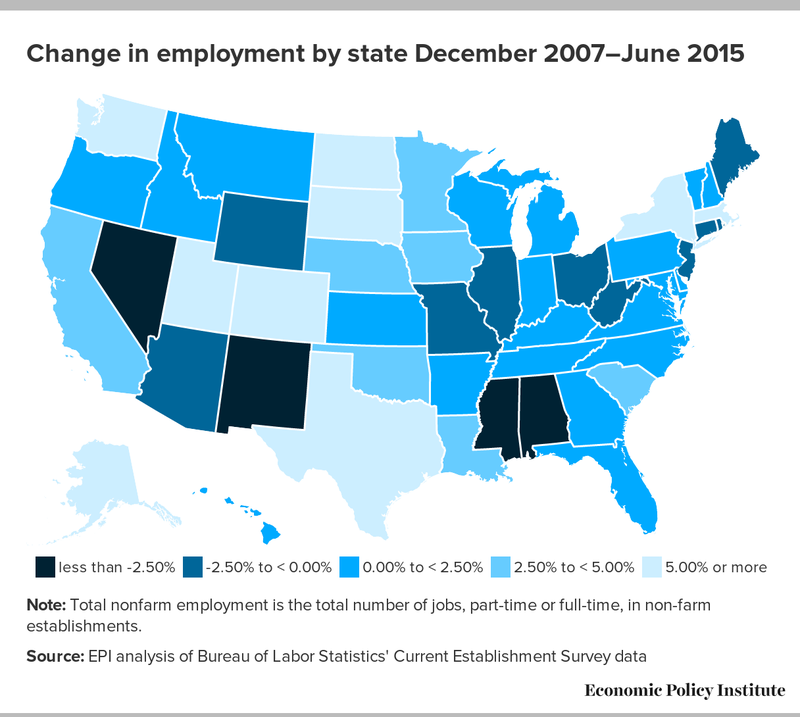 Most states continued to add jobs, although slightly more states lost jobs in the second quarter of 2015 than was the case over the same period last year. Unemployment rates continue to tick down in roughly half the country, while a handful of states saw notable upticks in unemployment. Only 13 states have reached their pre-recession rates of unemployment. From March to June, 38 states and the District of Columbia added jobs, with the largest percentage gains occurring in Nevada (+1.6 percent), Virginia (+1.0 percent), and Utah (+0.9 percent). Utah has had the strongest pace of job growth of any state over the past year, with cumulative job growth of 4.3 percent since June of 2014, compared with growth of 2.1 percent for the country as a whole. From March to June, twelve states lost jobs, with the most significant losses concentrated in energy-producing states. Wyoming (-1.6 percent), North Dakota (-1.0 percent), and Nebraska (-0.8 percent) had the largest percentage losses. Over the same period, unemployment fell in 25 states and the District of Columbia. Indiana (-0.9 ppt), Connecticut (-0.7 ppt), and the District of Columbia (-0.7 ppt) had the largest declines. Twenty states experienced an increase in their jobless rates, with particularly large increases affecting West Virginia (+0.8 ppt), Oklahoma (+0.6 ppt), and Alabama (+0.4 ppt). Four other states (Alaska, Kansas, New Mexico, and South Dakota) had unemployment rate increases of 0.3 percentage points. West Virginia’s unemployment rate is now the highest in the country at 7.4 percent. Six years into recovery, most of the country has reached a point of middling economic normalcy, yet state labor markets remain far from fully healed. Fourteen states have yet to reach the same number of jobs they had prior to the Great Recession—saying nothing about jobs that should have been added to accommodate population growth since that time. In that context, there should be no pressure for the Federal Reserve to begin slowing the economy until the country achieves the genuine full employment that will broadly raise wages and help shrink longstanding gender and racial wage inequities.